Google Analytics tells you what happened on your website. KISSmetrics tells you who did it. KISSmetrics works by pooling your online data (e.g. website activity, webinars, email opens/clicks, online payments) with your offline data (e.g. direct mail, conferences, phone calls) to reveal every touchpoint a person has with your company, both before and after every purchase. Then zoom out and get the ROI of your marketing by studying various pre-made reports about these people. 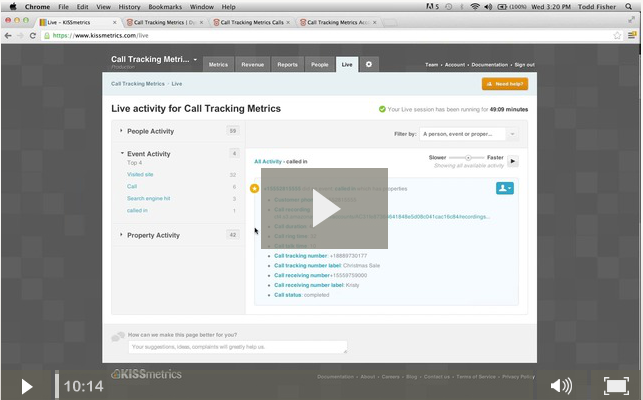 Once you create your KISSmetrics account, you can link it to your Call Tracking Metrics account in one easy step. You will be able to see your inbound calls in your KISSmetrics reports and real time activity feed. This will allow you to have a complete picture of each persons interaction history no matter where it happens- web, mobile, social, desktop… and now calls! PLUS- Friends of CallTrackingMetrics will receive a 14 day free trial to try the KISSmetrics service.